Sparklehorse, Danger Mouse, David Lynch and an all-star cast of contributors have made one of the best albums of 2009 so far. Good luck finding it. That's the good news. The bad news? It isn't available in stores or online due to a copyright beef on the part of EMI. As a nose-thumbing stopgap, the trio is releasing Lynch's book of photography (meant to provide a visual narrative for the music) with a blank CD-R and the message, "For legal reasons, enclosed CD-R contains no music. Use it as you will." The album is streaming at NPR.org here, and is available for download on various file-sharing web sites. While buying the blank CD-R may seem silly, it includes a full-color book of Lynch's haunting accompanying photography -- thus the $50 price tag. The copyright issues that have blocked the album's release have gotten it a fair amount of press, but Dark Night of the Soul deserves the attention based on the merit of the music alone. The all-star cast, which rivals that which appears on this year's much ballyhooed (and spookily similarly titled) Dark Was the Night compilation, turns in nearly universally stellar performances. But the real star here is Sparklehorse's Mark Linkous. His first full-length since 2006's Dreamt for Light Years in the Belly of a Mountain (which also featured contributions from Danger Mouse), Dark Night of the Soul is easily the most cohesive and consistent product of his heretofore only occasionally brilliant career. Much has been written about Linkous's 1996 overdose on Valium, anti-depressants, and alcohol (and the several-minute “death” that followed when his heart stopped) while on tour with Radiohead. There's no need to recount the sordid details here. But it's impossible to separate Linkous's artistic output from his troubled past when it so often deals in such dark subject matter. That's what makes David Lynch such an interesting foil for Linkous. While Lynch has spent his career creating a freakishly dark world, Linkous has spent much of his living in one. Not to be forgotten in the equation is Danger Mouse, who also has a history of imbuing his projects with a weird, sometimes sinister atmosphere -- most famously in Gnarls Barkley, but also with the Gorillaz, MF Doom, and others. On Dark Night of the Soul, he does far more than just supplement the soundtrack with his signature trippy laptop wizardry. He has a preternatural ability to play to the strengths of the contributors, who, it must be said, bring far more to the table than their voices. It's clear most, if not all, were involved in the songwriting process, and many of these songs could easily be mistaken for works by other bands. Jason Lytle's two contributions -- "Jaykub" and the show-stealing "Every Time I'm with You" -- sound like cuts from a lost Grandaddy album. Likewise, album-opener "Revenge", featuring the Flaming Lips, hearkens back to their Soft Bulletin days. "Little Girl", featuring a intoxicating turn by a self-deprecating Julian Casablancas, echoes a more electronic-sounding Strokes, all the way down to the noodly guitar solo. It's tempting to credit the greatness of Dark Night of the Soul (and it is unequivocally great; a shoe-in candidate for best album of the year) to the excellence of its contributors. But longtime Sparklehorse fans will hear Linkous's fingerprints all over it. Tonally and thematically, its a tall glass of the same emotional cocktail of world-weary depression and wide-eyed wonder that Linkous has been serving up since he recorded the song that best sums up his ethos, "It's a Sad and Beautiful World", for his 1995 debut, Vivadixiesubmarinetransmissionplot. 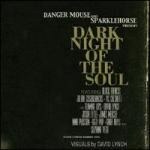 What sets Dark Night of the Soul apart from prior Sparklehorse albums -- aside from the superlative collaborators and contributors -- is its narrative ambition. It's not exactly a concept album; it's too impressionistic, and doesn't follow a traditional narrative arc. But its goal is obviously to lead the listener on a moody, existential journey. From meditative monologues about romantic angst (the Wayne Coyne-sung "Revenge"), to fuzzed out rave-ups about self-loathing and misanthropy (the Iggy Pop-crooned "Pain"), the songs all either describe, confront, bemoan, or reflect on the deep spiritual crisis the album title suggests. But it's not all necessarily depressing. Linkous's biggest strength is his uncanny way of viewing even the bleakest circumstances with a whimsical detachment, and, in fleeting moments, to transform them into something joyful. This is exhibited late in the album on two consecutive female-sung tracks: "Daddy's Gone", featuring Nina Persson, and "The Man Who Played God", featuring Suzanne Vega, both of which strongly resemble Linkous's finest earlier work. They're effervescent little pop gems strummed out on crunchy guitars that beguile the listener with their radio-ready melodies. But the pop pleasantries don't last for long. Linkous and Danger Mouse close out the affair with two mercilessly dark tracks featuring a ghoulish-sounding Vic Chesnutt and an eerily distorted David Lynch, respectively. The album's coda is also its title track, a funereal dirge on which Chesnutt sings in a despondent howl -- a reminder of the inevitable encounter with mortality that awaits us all, and the primal despair that'll accompany the moment. Few contemporary pop albums have spoken to the human condition so eloquently, and given the listener so much pleasure in the process, than Dark Night of the Soul. It's no exaggeration to say Danger Mouse and Sparklehorse have crafted a near-masterpiece. Its only real blemish is the plodding, misguided "Angel's Harp", on which Black Francis's talents are sadly wasted. But Linkous would be be the first to concede that nothing's perfect -- and if it was, it wouldn't be nearly as beautiful.